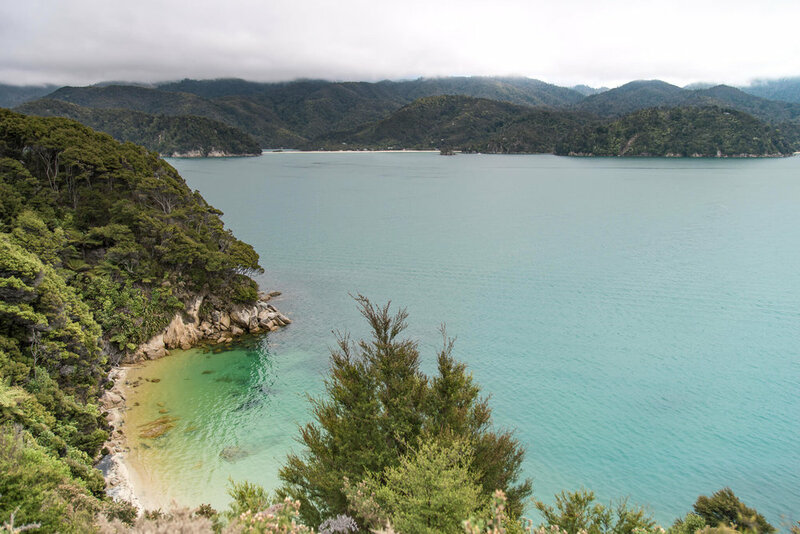 For my second trip with Jetstar NZ, I chose to fly into Nelson, on the north coast of the South Island, to explore the Nelson Tasman region. Up until then, I’d been to New Zealand 3 times, but always to Queenstown and out of all the people I spoke to at home in the lead up to this fourth hop across the pond, only one person had heard and been to Nelson. In just under 4 days, Luke and I travelled through paradisal coastlines, picturesque countryside, remote and rugged beaches and sleepy bays, with a few side trips to charming local eateries thrown in for good measure. But before I dive into all the details, I want to share a story about my very first few minutes in Nelson. In my post-flight coma, I was trudging along the tarmac, heading into the terminal. I was expecting to get herded through baggage claim (where I was planning to collect myself in addition to my bags), before going through the arrivals gate to meet Jessie from the Nelson Regional Development Agency and Sally from Nelson Airport. But of course, Nelson Airport is a regional airport - there is no baggage claim (it’s a cart) and there is no arrivals ‘gate’. So I was most taken aback when I saw a sign bearing my name through the fuzzy sliding doors of the terminal. There were Jessie and Sally, with big grins on their faces, a bag of pressies in hand and infectious enthusiasm levels that promptly shook me out of my daze. We chatted away, until our bags were the only ones sitting forlornly on the cart. I was massively touched by the welcome and even more so, when I realised that my gift was a thoughtful selection of local goods. Jessie and Sally thought that we were picking up our campervan that night and they didn’t want us to have to go grocery shopping as well. There was a fresh loaf of artisanal bread, a jar of Pic’s Peanut Butter, a blueberry and apple CHIA drink, some grounded Zumo coffee, a block of Whittaker’s Tasman Pear and Manuka Honey chocolate and a bag of Proper Crisps. This amazing welcome only set the tone for the rest of our stay in the region, where I continued to be blown away by not only its stunning landscapes, but also by the warmth, zeal and humility of the people. Thank you so much to Jetstar NZ and especially Jessie from the NRDA and I Love Nelson Tasman. One of the biggest loves in my life is immersing myself in beautiful places and you have helped me place another precious pin on my world map. 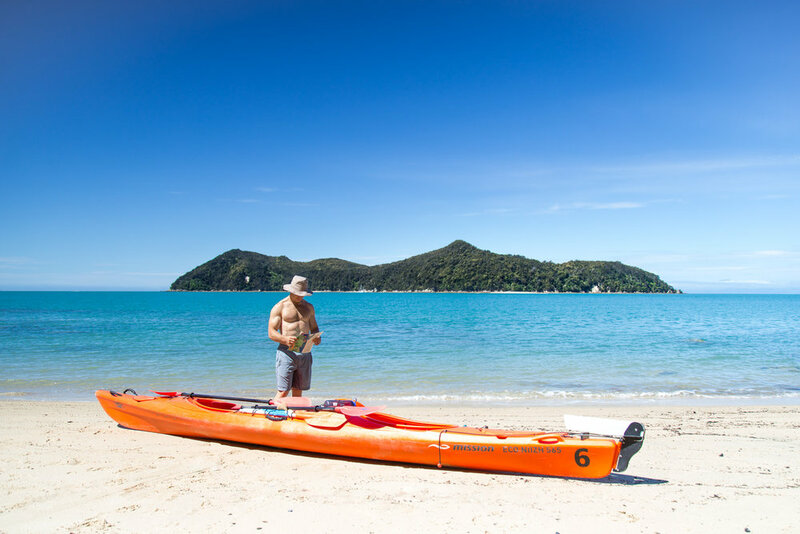 Our first stop was Abel Tasman National Park, an idyllic coastal wonderland that we were fortunate enough to explore both by kayak and on foot, with thanks to Marahau Sea Kayaks and Marahau Water Taxis. As we paddled into the Astrolabe, the sun shone and it was an explosion of colour; the brilliant turquoise blues and emeralds of the water, the bold greens of the forests on shore and the bright white sand of all the little beaches that fringed the coast. To be in the middle of such beauty was almost surreal and it wasn’t long before we settled into the groove and the rhythm of the catch and pull became second-nature. Four hours sped by as we lost ourselves in the hues and textures, in the soothing lapping of water against our kayak and in the cacophony of native birdsong. Before we knew it, time was up. Back at Marahau Beach Camp, we watched as fellow travellers started returning from their various day trips and adventures and one thing was clear, everyone was high on life. Sunkissed smiles were shared and beer handles were clinked all throughout the evening. The next morning, the water taxi dropped us off at The Anchorage. Here, the arc of glittering sand was flanked by lush forests that hid everything beyond the beach from sight. It felt as though we were on a deserted island. 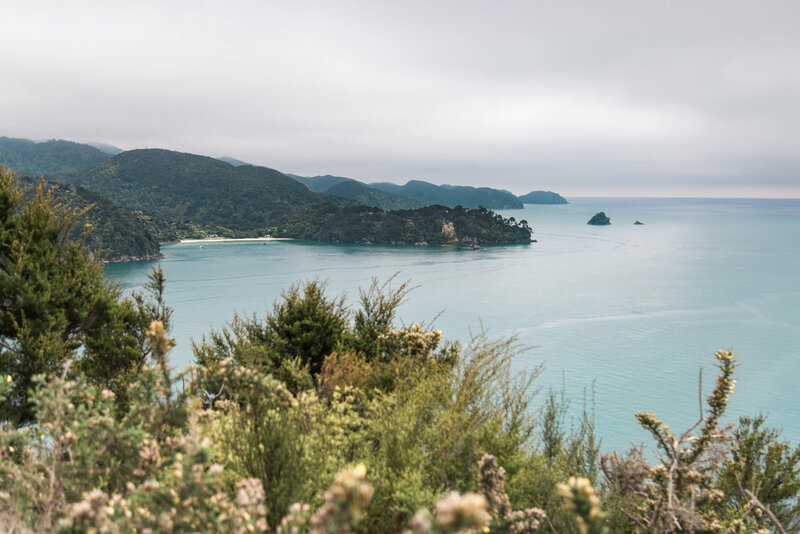 For 4 hours, we looped around Pitt Head through cooling greenery that opened up to views over postcard-perfect bays and coastal panoramas that looked so mystical on this overcast day. The sun only decided to come out to play at the very end when we were back at The Anchorage, waiting for our ride back. It was so enticing that we made a last minute dash into the nippy waters, giggling like children without a care in the world. And then we found ourselves at Golden Bay, which is simply put, out of this world. The two most significant landmarks here are Cape Farewell, the most northerly point of South Island and Wharariki Beach, where the iconic Archway Islands stand. 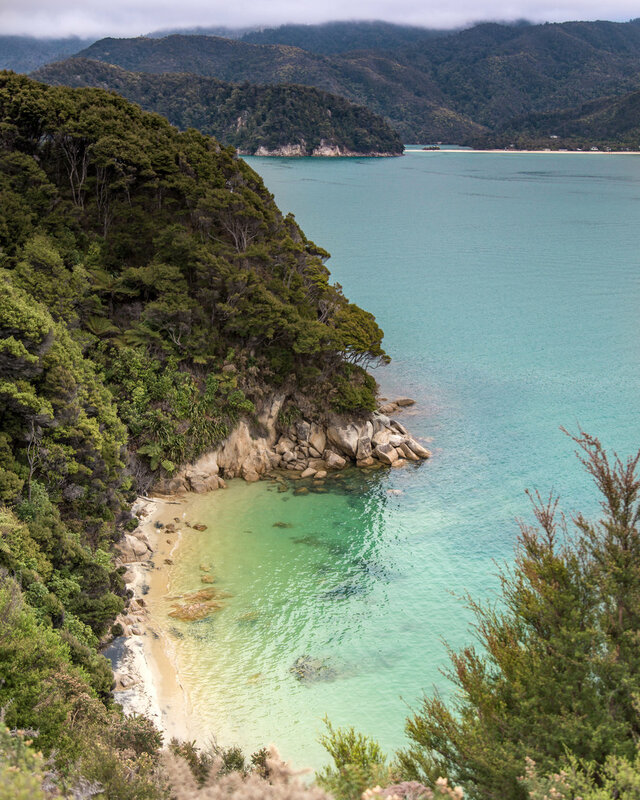 The coastline here was totally different to Abel Tasman - it was wild, windy, remote and exposed. Instead of feeling blissed out, I felt almost on edge, with every inch of me coming alive. There was an electricity in the air that was borderline intoxicating and hostile. 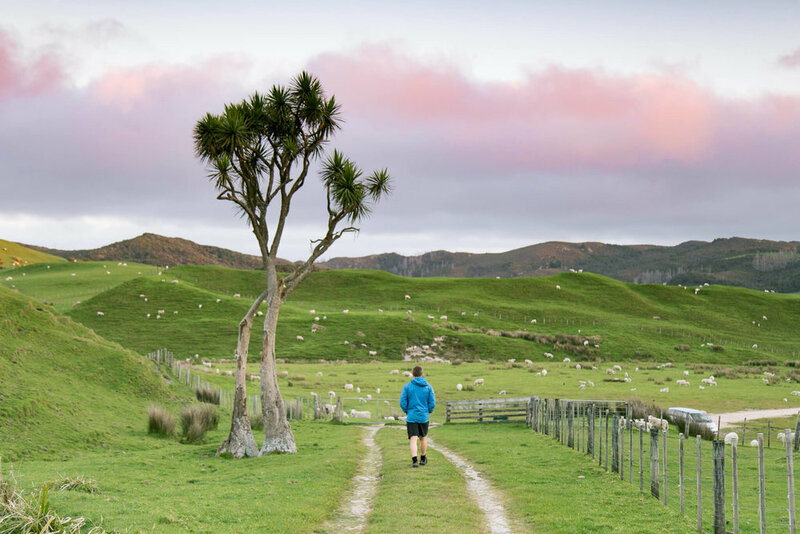 The rolling countryside on the way to Cape Farewell was so peaceful so when the pathway ended at such an loud view, its impact was only intensified. 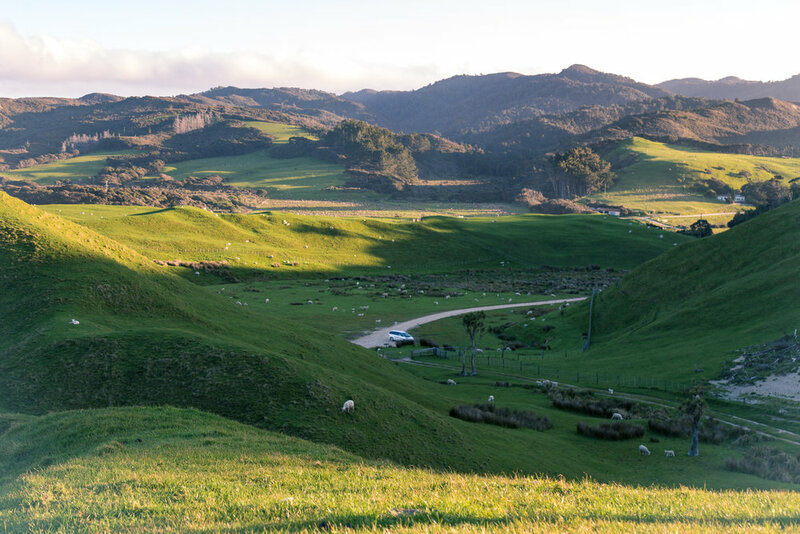 There was the Tasman Sea stretching out into the horizon, framed by this magnificent arch on the left and an almost lime-green, sun-drenched headland dotted with sheep on the right. Down below was a small beach, from where we saw seals emerge. As the sun set, light glinted off the arch, the tide came in, the sky changed shades and the wind howled. The landscape was epic and it felt as though we were on the brink of something devastatingly beautiful. And yet, behind us, that gentle countryside still sat, ready for us to retreat to, once we had enough of all the wild. Cape Farewell was my favourite place from our trip. 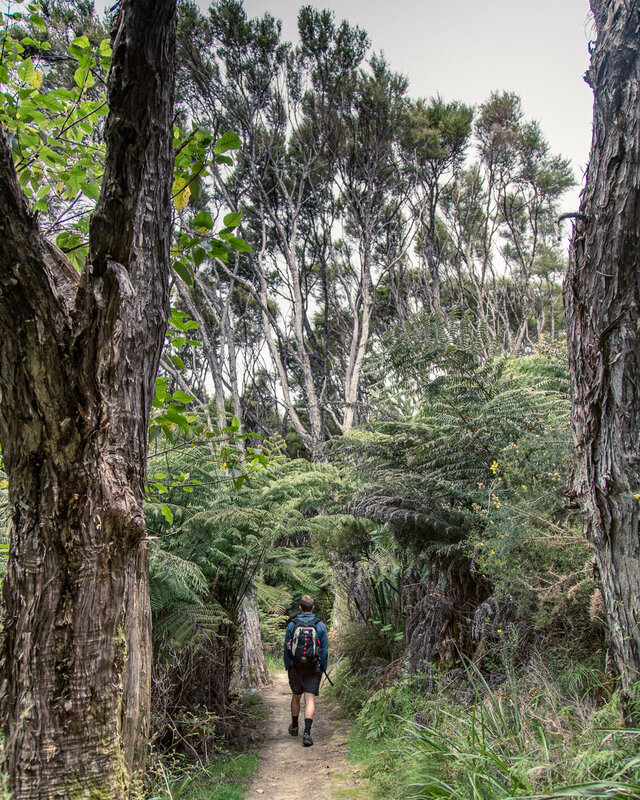 The next morning, we found ourselves strolling through the same picturesque hills on our way to Wharariki Beach. The sand dunes looked alien under an interplay of shadow and light. They led to a flat, endless beach, only interrupted by these massive rock stacks known as the Archway Islands. These formations looked intimidating, standing there commandingly on this empty beach. As we walked away, the wind whipped up the sand, sending it flying up the beach in ghostly streams, lashing at our legs. It was as though Wharariki Beach was casting us out, showing us that maybe we were briefly welcomed, but we didn’t belong there. We hurried back to our campervan, invigorated. It was our last morning in Nelson and we were determined to pack in one last adventure. Just 30 minutes out of Nelson is Cable Bay, a sleepy, quiet nook tucked away at the very end of a thin strip of land joining Pepin Island (privately owned!) to South Island. A 20-minute uphill hike through private farmland and lots of sheep took us to Cable Bay Lookout. Laid out in front of us were the green folded hills of Pepin Island, contrasting so vibrantly with the turquoise blue ocean and just over the other side of the causeway, we could see the intricate braids in the sand, exposed by low tide. Up high bathing in the morning sun, looking out over these colours, patterns and textures, everything felt calm and right in the world. 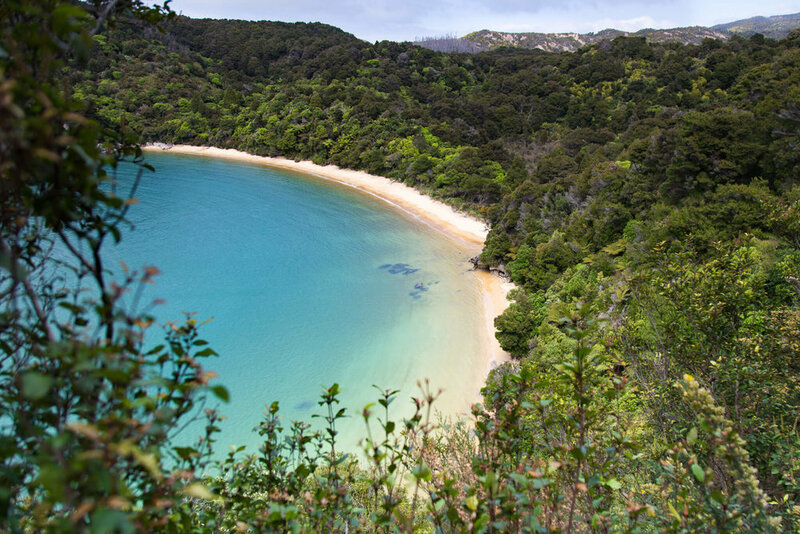 I could imagine entire summers being spent here; taking scenic walks, going for sunrise paddles, lazing about on the shingle beaches...Cable Bay was Luke’s favourite part of the trip. As we flew away from Nelson later that day, I finally had a moment to let the dust of an absolute whirlwind of a trip settle. We had done so many things and seen such different, always beautiful terrain in a short amount of time and had barely scratched the surface of the Nelson Tasman region. One day, I will be back; I will be back with unmeasured time to trace my way all the way along Cape Farewell to Golden Bay, stopping at a whim to explore all the untamed and isolated corners and soak up that wild Nelson Tasman coastline.